What is PLAY – Creative Gaming Festival? The Creative Gaming Festival is about hands-on experience, experimenting, exchanging information, enjoying games, inspiration and above all a sense of community. PLAY is the platform for everyone who works with, develops and loves games. The program consists of over 120 events; some program highlights are: workshops, exhibitions, international guest speakers, unique action art events and the international Creative Gaming Award. The 10th edition of PLAY – Creative Gaming Festival runs from November 1st through 5th. It transforms Hamburg into an experimental space for digital games. And what is so special about the Festival? PLAY is important because it makes clear that digital games have nothing to do with fat dumb players; rather they are a defining culture. Games tell stories, provide impulses and stimulate creative processes. They influence other cultural forms such as contemporary theater or the visual arts; and they provide opportunities for active participation. Games are not aliens. They have grown out of our culture. They satisfy a basic human need to play, to try things out and to slip into other roles. And the Creative Gaming Festival offers a program through which you can understand what is meant by the digital games culture. Here you can get your hands around it and try it out. PLAY is in its 10th year. Why has the Festival survived so long and grown from year to year? PLAY is significant each year because it focuses on the changes that occur from year to year. Only someone who tinkers with systems and thinks beyond their boundaries can effect changes. This is only possible through a worldwide, unique, multidimensional approach. In order to continue to be innovative and “game changing”, each year the Festival takes up a significant, socially relevant new theme. PLAY17’s motto is “The Time is Now”, what does time have to do with digital games? There are many different connections. One is time critical games where the player must complete a set of tasks within a fixed time span, that is playing against time. Another is games in which the player can turn back time and thereby influence the game plot. An important theme in this context is, of course, the future of games: What will games look like in 10 years? What interfaces will be used and how will virtual and augmented reality games evolve? How, in the future will a player merge with the game? In addition, many other questions come to mind concerning the roles played by death, historical representations or archeological exploration in games. Also, the program will take up themes such as time management in games development as well as in game playing sessions. And how does the program reflect this theme? Again, this year the Festival theme is a common thread running through all Festival formats. So, for example, there will be game design workshops for school children that will closely examine the time variable or explore phenomena such as speedruns and walkthroughs. Impulse sessions about time in story telling are part of the program as are roundtable discussions during which prominent guests exchange different ideas and perspectives on the “Time is Now” theme. In the exhibition attendees will be able to view installations that employ unusual access methods to time in games. Finally, our Festival theme is reflected in our 10-year anniversary celebration. For example, we will show the results of PLAY Labs from previous years and there will be a gala with the best PLAY formats from earlier festivals. What highlights can visitors to this year’s PLAY – Creative Gaming Festival expect; what type of visitors can you anticipate? This year we will devote time to that which is past, that which is to come and that which is current. This is evident in the program. At the PLAY Birthday Gala on Thursday evening we will look back on the 10-year media-pedagogical work we have done with games and will commune with our Initiative Creative Gaming travelling companions. 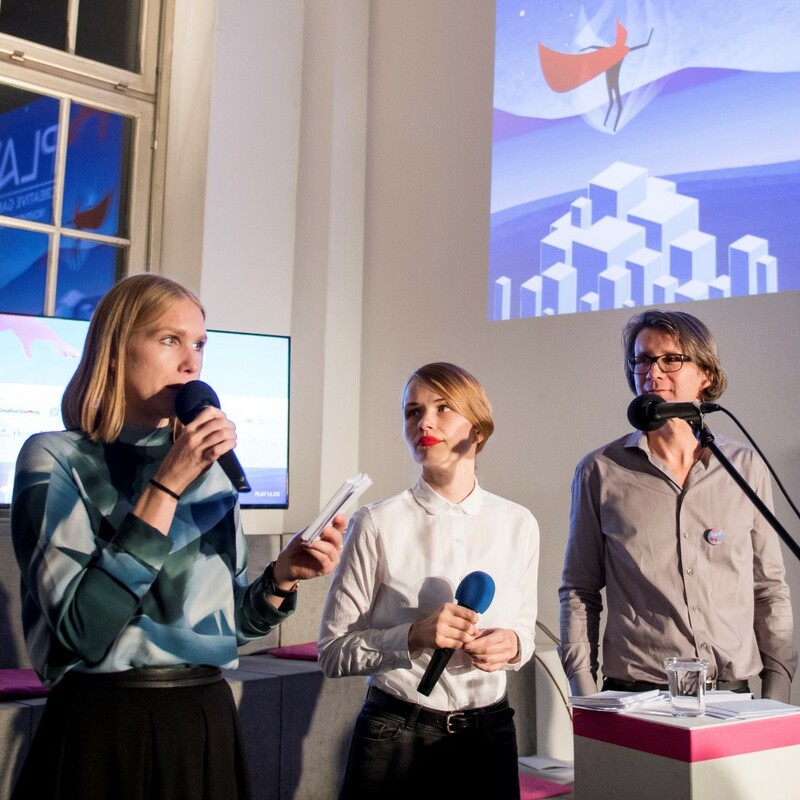 Attendees can directly explore how digital games can be used creatively at numerous hands-on exhibits in the Zentralbibliothek (Central Library) and the Markthalle. The third edition of our poetry slam with games poetry occurs on Friday evening; over three days at LABOURGAMES, 50 school children will develop new games ideas and on Saturday evening, the Creative Gaming Award will be given to the most innovative next generation games and concepts. PLAY is a festival for doers, players, visionaries and for innovative thinkers. But, PLAY is also a place for all those who are curious and who still ask, what is so fascinating about games. Teachers can become acquainted with games as a new technique to be used in the learning process. Young people can discover how to become programmers themselves. Students can come to the realization that games are not just a science unto itself. And finally, PLAY addresses people who love culture. This year we are expecting around 8,000 visitors. Based on the distribution of the previous year, that breaks down to approximately 1,500 school children, 600 teachers, 1,200 students and 1,500 game professionals. The Festival takes place in venues that are established Hamburg cultural centers. What significance does that have for the Festival? PLAY is at home where culture becomes visible. From November 1st to 5th in the Markthalle, the Barlach Halle K and the Central Library visitors will be able to try out, discuss and develop games. This year the Creative Gaming Festival will be held at these three venues in the vicinity of the Hamburg Main Station. As always, we have selected different, unusual and surprising locations; places where games are not usually found. You are always talking about education; but, games are really about having fun. How do these two ideas fit together? Games are above all an experimental space. As a player, you can slip into other roles, penetrate other worlds and move beyond the boundaries of reality. You can view things from a different side by changing your perspective and you can structure the experience space yourself. This is an important driver of the educational process. The motto of Creative Gaming is “Gaming with Games”; this means to experience how you can change, manipulate, create and further develop digital games. The role of digital games is taken into account especially in the fields of education, science, society and culture. The Festival opens with a large vernissage on Wednesday evening, November 2nd, in the Markthalle and the Barlach Halle K. A variety of workshops for, among others, school classes, students and teachers are conducted on Thursday, November 2nd, and Friday, November 3rd. On Saturday, November 4th, workshops for advanced practitioners and experts will be held. Sunday, November 5th is Family Day. For the entire Festival attendees can visit the exhibition space in the Barlach Halle K. In addition, there are plays and happenings, roundtable discussions and an entertaining evening program; for example, the PLAY Poetry Slam that we are bringing back to the stage in celebration of the Festival’s 10th anniversary.